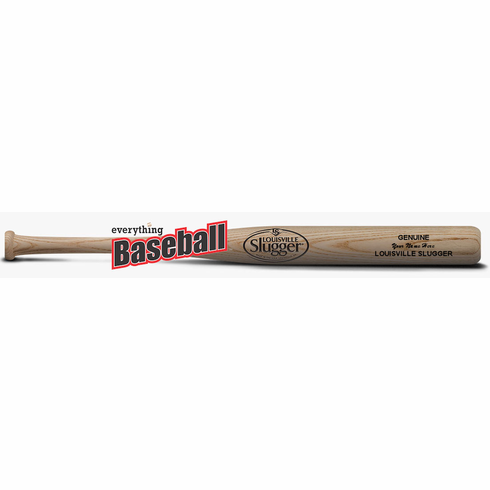 Louisville Slugger Custom Miniature Wooden Baseball Bat. Our 18" miniature Louisville Slugger bats can now be engraved with four personalized lines just like our full-sized personalized bats. This miniature bat is an exact replica of its larger counterpart. Recipient's name is engraved in the identical fashion as the Major Leaguer's. This personalized mini bat makes a perfect "new baby" gift or suits those occasions when budgets are limited. Natural finish with black imprint. Up to four lines can be personalized - maximum 20 letters and/or spaces per line.